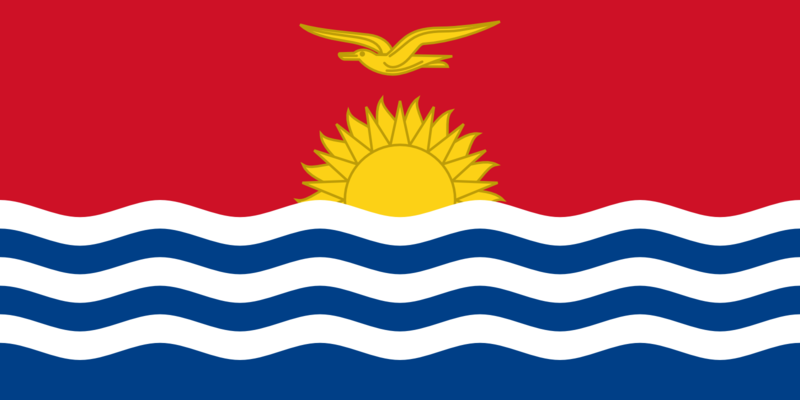 The flag of Kiribati was officially adopted on July 12, 1979. The blue and white bands represent the surrounding Pacific Ocean. The frigate bird flying over the rising sun is taken from the coat of arms, and is said to symbolize strength and power at sea. The bird on flag of Kiribati represents the authority, freedom and command over sea of the people of Kiribati. The rising sun on Kiribati flag over the red sky shows the equator. The 17 rays of the rising half-sun represent the 16 Gilbert islands and Banaba (former Ocean Island). The blue and white wavy lines represent the Pacific Ocean which circles around the country. The whole image of Kiribati’s flag actually shows the geographical location of the islands of Kiribati’s, spread out over the equator for over 4000 kilometres and cover over two million square kilometres of the Pacific Ocean.